How do REITs hold up versus inflation? I'd assume they ought to do OK. I'd think holding real estate ought to be a good hedge against inflation in general. People gotta live somewhere. I decided to look at the oldest REITs I could find to get a longer term picture. REIT.com says in their timeline that the first REITs were : "The first REITs--Bradley Real Estate Investors, Continental Mortgage Investors, First Mortgage Investors, First Union Real Estate (now Winthrop Realty Trust, NYSE: FUR), Pennsylvania REIT (NYSE: PEI) and Washington REIT (NYSE: WRE)--are created. The latter three are still in existence today." FUR and PEI have history at Yahoo finance going back to the 70's. I pulled the historical prices from yahoo and then I averaged out the annual adjusted close prices for each year. Those adjusted close prices include dividends and splits. I got inflation info from US Inflation Calculator who got it from the BLS. 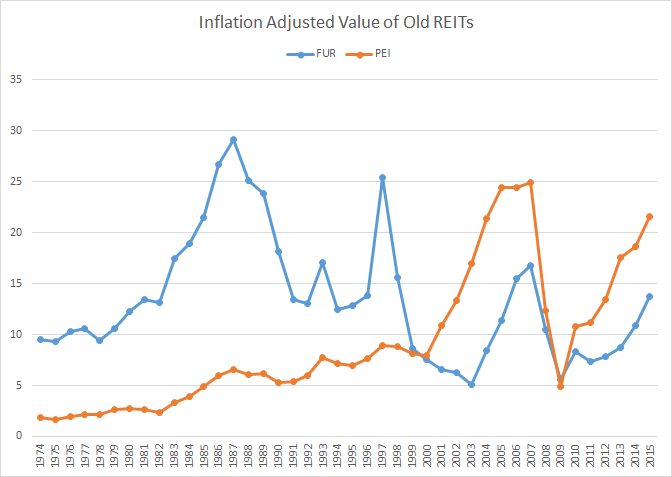 What we're looking at here is the historical prices of the two REITs over time adjusted to inflation. PEI did OK longer term. FUR was shaky. If you bought PEI back in the 70's you'd have spent around $2 a share in 2015 dollars and that REIT trades for over $18 as I write this. But if you bought FUR in most of the 80's and 90's you'd be behind inflation. The housing bubble inflated REIT values abnormally. If you bought a REIT during the peak of the housing bubble then you'd have trouble recovering from it even now. In hindsight, both PEI and FUR would have been poor choices if you'd bought them around 2006 or 2007. FUR's long term performance has been really up and down. I don't know why this is. I haven't looked at the history of that stock to see if theres an answer. Keep in mind that this is only two REITs here. Thats not much of a sample size to make any broad conclusions from. 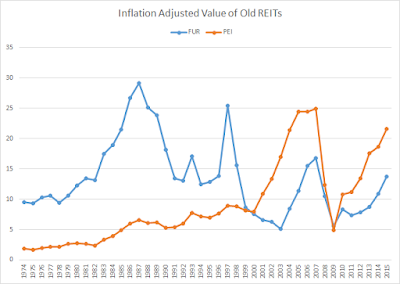 But there are only a handful of REITs that have been around since the 70's and I wanted to get a look at how REITs hold up versus inflation over a longer period.